If you’ve been around here for a while, I’m sure you’ve noticed that my posting has been a little …haphazard lately, shall we say? 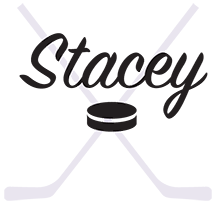 While I could chalk it up to being busy (because hello hockey season), the honest truth is that there are things I’ve wanted to say and couldn’t find the words for them. I’ve spent an entire season trying to help a player who doesn’t fit in with his hockey team. This year marked the first year ever I had an Atom player, a Novice player and an Initiation player. That alone has made for some rather hectic weekends. Several of which saw me start the day driving to the arena at 6:30 am and end it driving home at 6:30 pm. It happens and I don’t regret even one second of it. That’s not what made this year tough. I couldn’t put my finger on what exactly was nagging at me but something wasn’t right. And it wasn’t even Initiation hockey which usually gets a little repetitive towards the end of the season. Then a couple of weeks ago, it became clear: there was a drastic difference in experience between our Atom team and our Novice team. Now please let me preface this by saying that this has little to do with the coaching staff and a lot to do with the boy being coached. And a good chunk of the blame falls squarely on my shoulders. Boy #2 struggled all.season.long. He is the carbon copy of his mama so it takes him a good amount of time to figure out where his place in the world. And he never found his place on his team. That chunk of blame that rests on me? Yeah, the fact that I couldn’t get him to two thirds of his team events outside of practice and games, thanks to our schedule. The bulk of team bonding happens off the ice and our schedule didn’t allow for it. Also, I was treating him the same way I treat his older brother when he has a problem. In doing this, I was forgetting that his personality has always been polar opposite from my more outgoing, let-it-roll-off-his-shoulders oldest child. His quieter, more tentative personality takes a back seat to the other more outgoing personalities on his team. It finally became clear back at the end of February. I had rushed home to get Boy #2 and Boy #3 to a much-needed hair appointment. Given the timing, I knew that Boy #2 wouldn’t make his practice but that Boy #1 had a practice right after that both could attend. So I sent them to the rink with HockeyDad for the Atom team practice. About halfway through I get a text: Be prepared to tear up. And a video. They were running through a drill I had seen dozens of times before. The team is divided in half and are put up against one another to race to the puck and score a goal. It’s good practice for skaters and goalie alike. It’s a race. I watched as Boy #1 got to the puck first (of course, speed has never been that one’s issue) and skated that puck up. Just as he got within shooting range, I watched him pass the puck backwards to his younger brother. Boy #2 then picks up the puck, skates the last little bit to the goalie and shoots. I watched a ten year old boy lift his goalie glove to let in a goal that he could have stopped with his eyes closed and one hand behind his back. And then I watched an entire team of 9 and 10 year olds celebrate this 7 year old’s goal like it was one of their own. That’s a lot to pack in to 8 seconds. And it highlighted to me the difference between teams. One has spent the entire season focused on having fun playing the game. And the other has focused on winning. I have watched several children on Boy #2’s team thrive in this environment where winning is the primary focus. In fact, had it been Boy #1 or Boy #3 on this team, we wouldn’t have had any issues. Different things motivate Boy #2. Ultimately, I know that Boy #2 loves hockey. Sure, there’s likely a sport he will love more but he continues to ask to play hockey. Until that changes, he’ll continue to play. In order to help him, here’s what we’ve started doing to help our player fit in with his team. Hockey camp. With Boy #1. More practice, less pressure and the comfort of having his brother with him for two weeks this summer. He’s wants to go back to hockey camp, or so he says. I suspect, right now, it’s more about the fact that he gets to choose his food from the cafeteria there, but Boy #1 figured things out there, maybe Boy #2 will as well. When possible, we’ve given Boy #2 the choice over which practice he attends, his team’s or his brother’s. We’re lucky enough that this is an option. He has always done better when he felt like he has some control over things. From a team perspective, it’s not ideal. It wont solve the issue of him not fitting in with his team. And it’s not what we’ve always preached to our kids, but at this point, I’m trying to salvage his opinion of the sport as a whole. So he gets a say in where he practices. Find the fun. With his personality, he tends to focus on the downside of a given situation. So wherever possible we are reminding him of the parts he loves about hockey. We gloss over the downsides and focus on the stuff that he enjoys. Reframe the negatives. In this area, I have struggled to help him through. Where Boy #1 and I could get by using the compliment sandwich technique (an approach that works great with some kids, but is an ineffective management technique), Boy #2 sees through the compliments and praise and gnaws away at the critique. Thanks to a discussion with a fellow hockey mom, we’ve spun that a bit and seem to be having success. With Boy #2, it’s all about the positives and how we can make them more positive. For example: Hey Boy #2, you were right in there battling to get the puck and when you did, you passed it out so that your team could get up the ice and score. If you keep doing that, over and over again, your team has more chances to score. Having realized exactly what the issue was, we’ve taken steps towards fixing it. As a result, we are able to finish out the season on a much better note. And we’ll be able to start next season off right.